If you are using Smart Bro pocket WiFi to connect to the internet with your mobile phones at home and even on the go, you can check this simple security tip to secure your network. You can put a password on your pocket WiFi broadband to avoid others connecting to your internet and limit data bandwidth only to your connected devices. 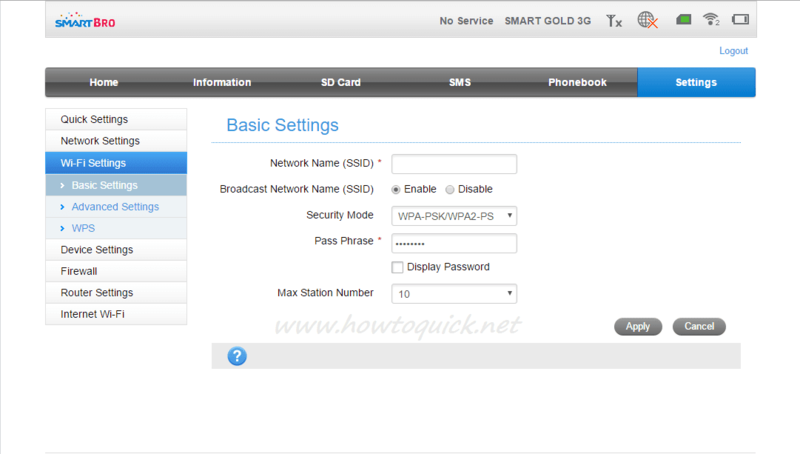 On your Smart Bro 4G Pocket WiFi, you can also edit the default WiFi name or SSID to the name of your choice. You’ll also have the option to hide your network so that other people cannot search your WiFi network. The WiFi router settings also lets you edit the password and add stronger security mode e.g WPA or WPA2. 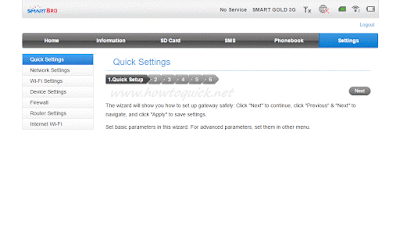 To do all that things in your device you can check out the steps below as your quick reference in case you lost the included quick start guide or manual. Type "smartbro" or "admin" as the username and password to login. Select "Settings" then "Quick Settings"
Click "Next" button make sure to stop under the "Security Configuration"
Select "WPA-PSK/WPA2/PSK" as the "Security Mode"
Then click "Next" button again, until you see the "Apply" button. Wait until it saves, your current connection will be disconnected. Scan for WiFi network and connect to your new WiFi network and reconnect using your newly created password when ask to connect. If you want to access your Smart Bro dashboard again, check out Admin Page Login and Password. 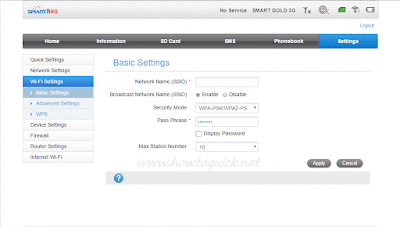 Browse Basic Settings, from there you can already edit your SSID, disable and enable broadcast network name, security mode and pass phrase or password. If every is clear and okay for you, you need to click Apply button to save the changes made. Note: If you hide or disable your SSID you need to connect to your WiFi network manually using and add network or Add WiFi option on your device.